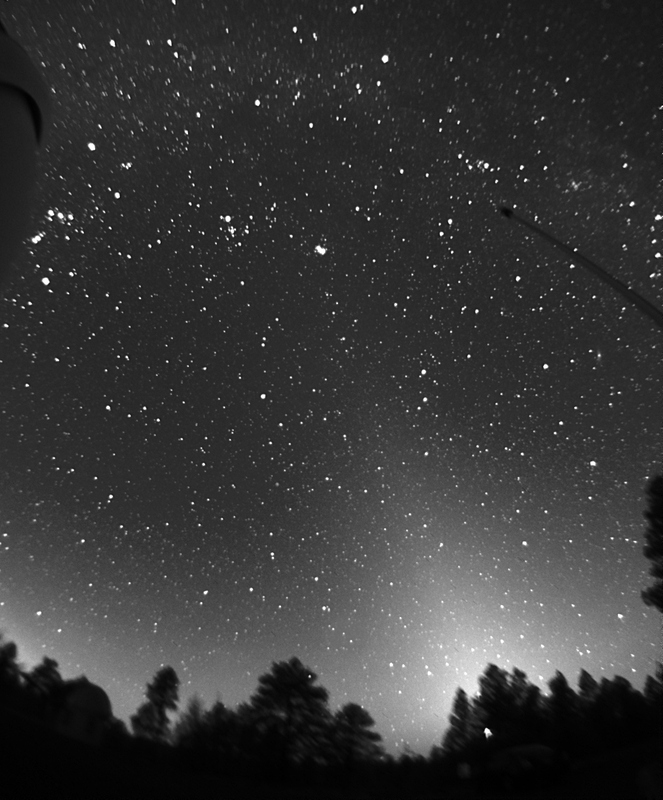 The zodiacal light at 7:51 pm (MST) on February 10, 2015, as seen from the west parking lot of the U.S. Naval Observatory near Flagstaff. 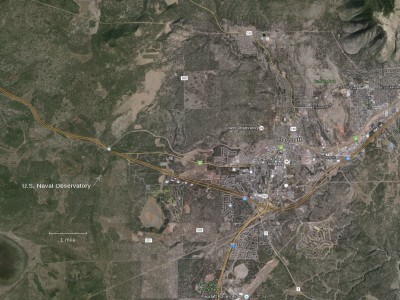 If you’re wondering where the Observatory is, it’s about five miles west of downtown (Google maps link). 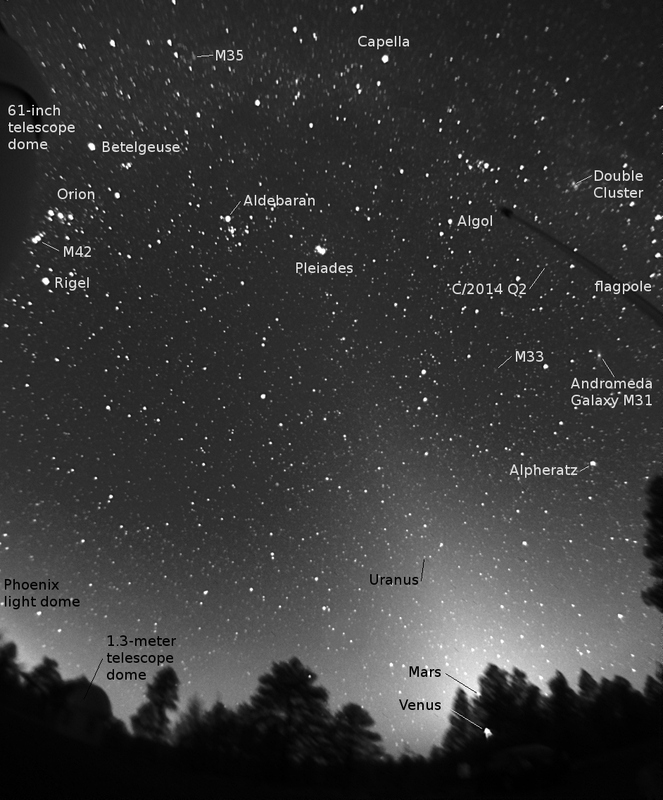 The Mars flyby of C/2013 A1 (Siding Spring) represented a unique opportunity for imaging a long-period comet and resolving its nucleus and rotation period. Because of the small encounter distance and the high relative velocity, the goal of successfully observing C/2013 A1 from the Mars orbiting spacecrafts posed strict requirements on the accuracy of the comet ephemeris estimate. These requirements were hard to meet, as comets are known for being highly unpredictable: astrometric observations can be significantly biased and nongravitational perturbations significantly affect the trajectory. Therefore, we remeasured a couple of hundred astrometric positions from images provided by ground-based observers and also observed the comet with the Mars Reconnaissance Orbiter’s HiRISE camera on 2014 October 7. In particular, the HiRISE observations were decisive in securing the trajectory and revealed that nongravitational perturbations were larger than anticipated. The comet was successfully observed and the analysis of the science data is still ongoing. By adding some post-encounter data and using the Rotating Jet Model for nongravitational accelerations we constrain the rotation pole of C/2013 A1.